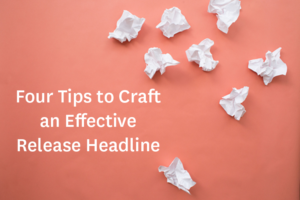 Of all the sequential steps that go into crafting an effective press release, putting an effective heading or headline at the top should, in theory, be the easiest element to hit the mark on. A lot of time and effort goes into preparing and fine tuning all the basic elements of a release: the headline, the content and angle, the timing, and the assets and information used to support its success. The headline is a key part of the release that you want to get right. Especially given it’s the first thing that meets the eye of the person who is deciding whether to open the release and go any further. Based on experience of reviewing press releases from top to bottom we have a few do’s and don’ts on headlines. A headline that is treated as an afterthought or is too rushed will risk missing the mark. A common mistake can be to start off with a placeholder headline to begin the process that is then left in place and isn’t re-thought. Spending time to revisit and possibly rewrite the headline when the text of the release is all set to go is always time well spent. It should almost go without saying that a sound rule of thumb for a headline is to read it in the context of how well it connects with the body of the release. Often the best way to gauge how well you’ve achieved that initial connection is to read the headline and first paragraph together. Is it obvious that they fit together and feed or flow into each other? If this was all the release consisted of do they make sense together and immediately set a journalist’s interest or curiosity in motion? The first rule of fit-for-purpose headlines should be to keep them short, simple and direct. Aside from the problem of headlines that are too long for no good reason, other things to avoid include not loading the headline with a jumble of acronyms or jargon. A release headline that makes a journalist scratch their head to make sense of can kill the opportunity. (Oh yes, and using ALL CAPS is generally not preferred). The good news is that most press release headlines hit the mark effectively enough to grab attention. They most commonly do that by providing a straightforward distillation of what the release says, reduced to what might be called a ‘one line pitch’ (a news pitch not a sales pitch). There is a knack to taking a headline up to the point where it both hits the mark and is compelling to a journalist. Keeping to the genuine news that’s in the release as the source for the headline keeps it real. The compelling ones will frequently zero in on and capture the best angle and amplify that into a headline that has some real zing. Not all headlines have to be plain and simple. It’s good to play around with options that may really catch a reader’s attention and road test them amongst your team. This may start with elevating a special word or phrase in the release – from one of the quotes it contains for instance – to the headline. If the story is strong you won’t need to contrive anything – and on a good day the headline may even write itself.